Pictured are Chris and Peter with Andy Scott (Artistic Director) and Lauren Scott (Artistic Advisor). Both are top performers in their own right, Andy being a saxophonist and Lauren a harpist. 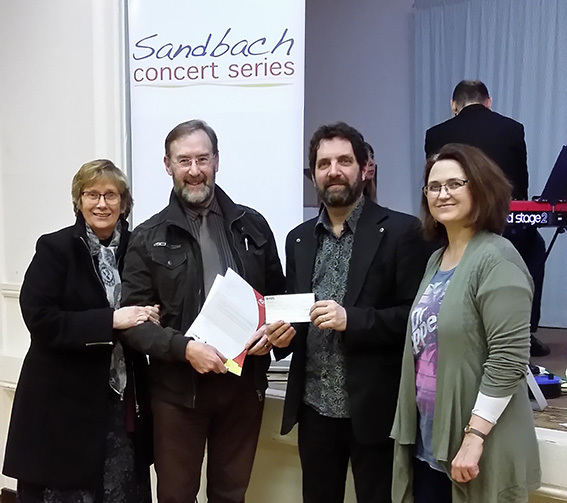 The cheque was to the Sandbach Concert Series, which stages eight concerts a year in Sandbach. Each concert features top artists playing a particular type of instrument or music, e.g. string instruments, piano or jazz, preceded by a spotlight session for up-and-coming youngsters from local schools, who are learning to play the type of instrument or music which is being featured in that concert. This gives valuable experience for those youngsters to perform in front of a live audience, which often includes the professionals who will follow them on stage in the second half of the concert. Each concert also gives a forum for an art exhibition by a local individual or group, and for a local charity to advertise its work.